All four Week 11 games were played on Sunday, April 2. At the Norman Broaster Stadium, visiting Belmopan Bandits SC kept their undefeated record intact, as they dropped Verdes FC, 2-0, with a goal each from Elroy “Bibbs” Kuylen (43’) and Highking Roberts (76’). Meanwhile, at the Carl Ramos Stadium in Dangriga, the visitors were again victorious, as Police United FC crushed Wagiya, 4-1, with goals from Jalen Myers (10’), Daniel “Danny” Jimenez (37’ & 89’) and Harrison “Cafu” Roches (40’); the only Wagiya goal coming from Latrell Middleton (20’). And it was the visitors again on top at the Victor Sanchez Union Field in Punta Gorda, as BDF got a goal each from Osmar Duran (34’) and Vallan Symns (49’ PK) to edge Freedom Fighters FC, 2-1. The veteran Wilmer Garcia (52’ PK) got the sole tally for Freedom Fighters. Here at the MCC Grounds on Sunday, Belize City fans got a treat, as the home team emerged victorious over Placencia Assassins in a 3-2 thriller. FC Belize’s Mexican goalie Rodrigo Vasquez scored on a free kick from more than half field, as the strong south-east wind surprised Placencia goalie Lincoln Lopez, carrying the high ball over his head and into the net at the 8th minute. Before the half ended, Luis “Baaka” Torres (42’ PK) equalized for Placencia from the penalty spot, after Vasquez had collided with Placencia striker Justin Linarez just inside the FC Belize eighteen. In second half, the Assassins suddenly took the lead at the 52nd minute, when midfielder Dellon Torres unleashed a right foot rocket from twenty-five yards that tore into the top left corner. But lightning struck quickly at the other end, when Vasquez again sent another long free kick into the Placencia box that resulted in enough commotion to allow FC Belize veteran Floyd Jones to drive in the equalizer from close range at the 56th minute. It was anybody’s ball game going into the waning minutes, and it looked like Ryan Simpson had scored a spectacular bicycle kick from the edge of the eighteen with his back to the Placencia goal; but goalkeeper Linclon Lopez made a spectacular diving save, tipping it over the cross bar near the right “pigeon hole.” A few minutes later, Ryan’s persistence paid off, as he managed to navigate past the Placencia defence on the right goal line, and his kick toward defender Collin Westby, who was covering the right goal post, promptly deflected off Collin’s leg and straight into the net. 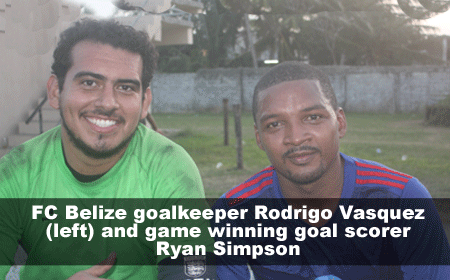 Genius or luck, Ryan’s shot was toward goal, and the desperate FC Belize team was overjoyed with their good fortune. It was heartbreak on the other end, of course, and understandably, because the Placencia boys played a great game, but fell short on the score card, 3-2. 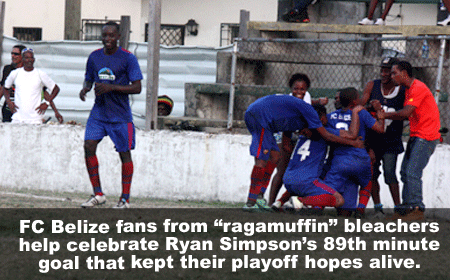 The loss put the Assassins out of playoff contention, but the win gave a lease on life to the playoff dreams of FC Belize. In last night’s Week 2 back-match at the Carl Ramos Stadium, FC Belize jumped to an early 1-nil lead on a 4th minute goal by veteran Mark “Kelo” Leslie; but Wagiya came back with a 46th strike by Krisean Lopez, and they had to settle for the 1-1 draw. 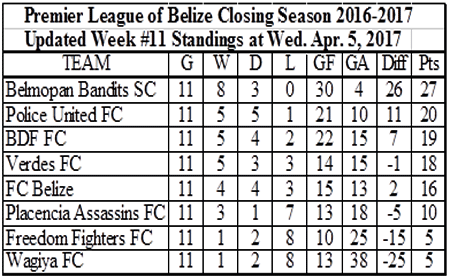 Nevertheless, FC Belize is still in playoff contention. The remaining 3 games will decide it all. Only the Bandits are presently sure of their playoff berth. 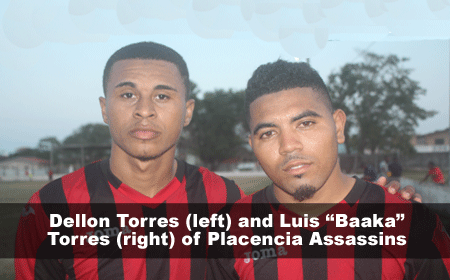 In a bit of surprise news this evening, a PLB release says that Placencia Assassins has gotten agreement from Belmopan Bandits SC to play their scheduled Week 14 game in Independence tonight, April 6, instead of Holy Saturday, April 15, when many Placencia players would be working in the tourist business. The game should not affect the playoff race, as Bandits are already “in,” and Placencia are definitely “out.” But the Assassins are playing for pride, and the Bandits are still protecting their undefeated status.